You boarded the Freight Train of the Santa Fe & Disneyland Railroad at the Frontierland Station. As your train follows the water’s edge, you gaze between the slats of the cattle car in which you’re seated. 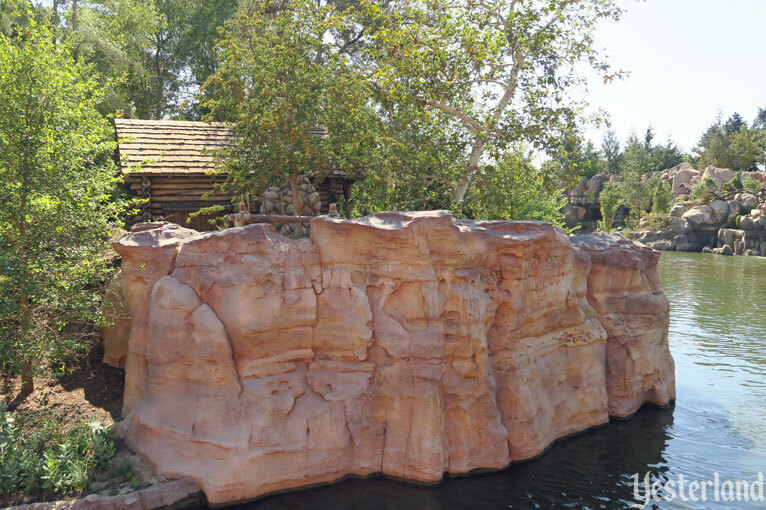 Across the water of the Rivers of America, there’s a rustic log cabin. That cabin is on fire! Oh no! There’s a man sprawled on the ground, with an arrow in his body, sticking straight up. He’s not moving. He must be dead. So that’s what happened. The settler was killed by an unfriendly Indian, who then torched the cabin. 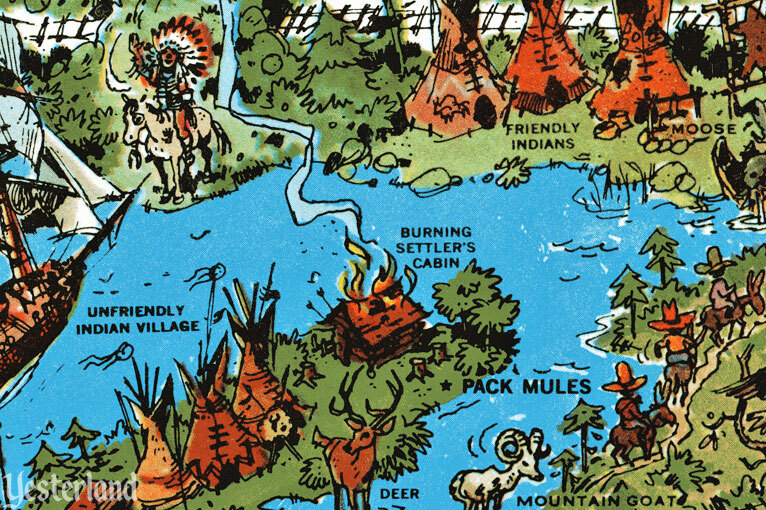 Your souvenir map shows that the Burning Settler’s Cabin is located right by the Unfriendly Indian Village. You can’t get to the cabin by foot. 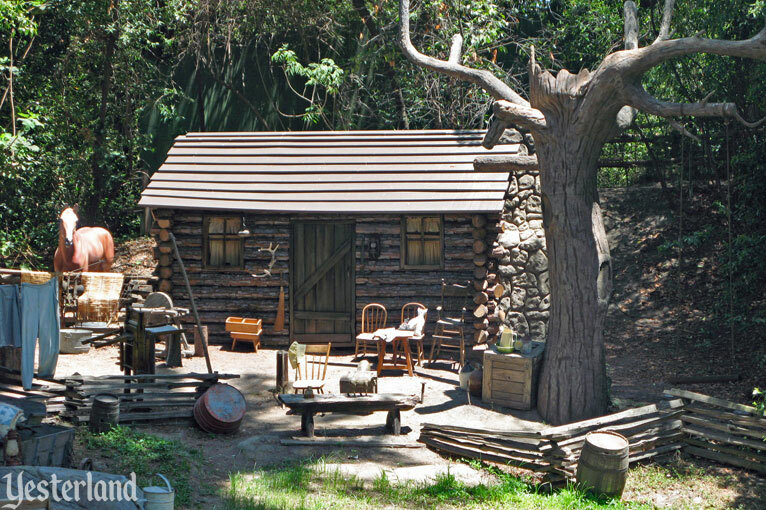 According to the Tom Sawyer Island map, the cabin is in “Indian Territory,” where “terms of treaty prohibit entry.” You wouldn’t want to walk there anyway, because you could wind up like the unfortunate settler. Taking another look at your park map, you might conclude that the settler would have been better off if he’d built his cabin across the river. That’s where the friendly Indians live. 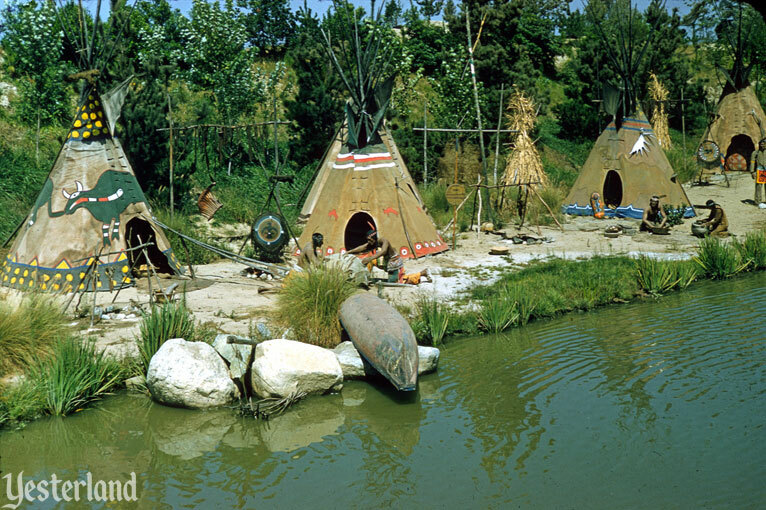 Another way to see the flaming cabin is to go on the Indian War Canoes, which leave from the Indian Village. Don’t worry. The Indians who guide the canoes are friendly Indians. The Burning Settler’s Cabin wasn’t an attraction in the traditional sense. 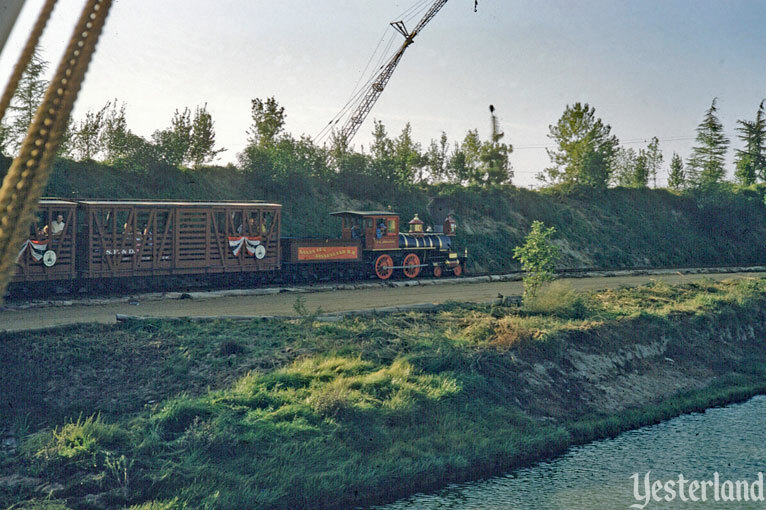 It was a dramatic show scene visible from the watercraft of the Rivers of America and from the railroad. 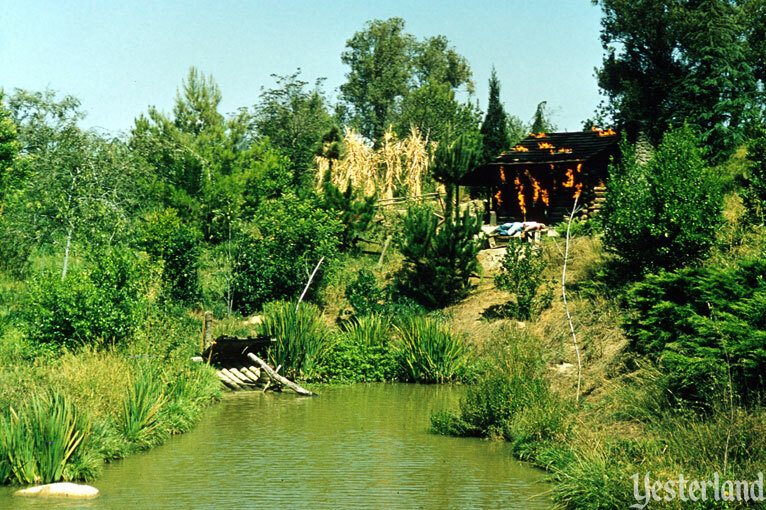 Added to the north end of Disneyland’s Tom Sawyer Island in 1956, it burned for more than four decades. The story of who lived in the cabin and why it was ablaze changed several times. The original story, as described earlier in this article, involved an Indian attack. In Walt Disney’s Davy Crockett programs, some Indians were friends and some were foes. This theme carried over to early Disneyland. In the early 1990s, an eagle nest appeared atop a dead tree trunk right next to the cabin. The new story was that the careless settler had accidentally set his own cabin on fire, endangering the nearby nest. The settler wasn’t very smart if he burned down his own home. The eagles were even less smart if they built their nest so close to a settler’s cabin. 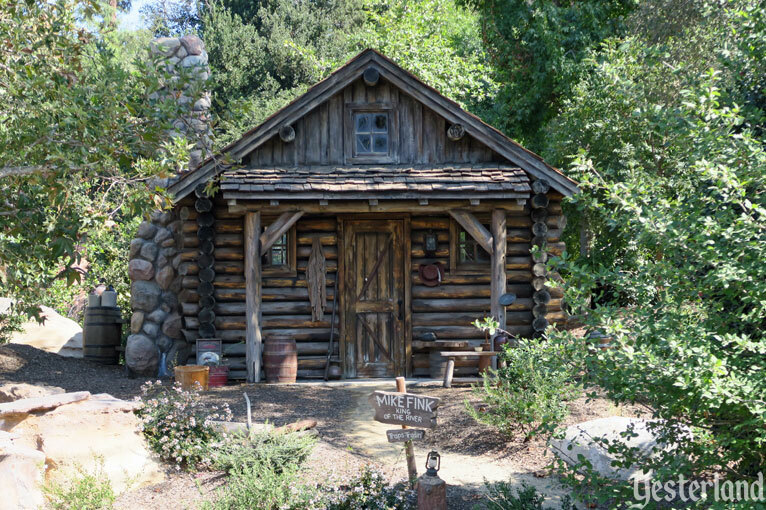 A half century after the opening of Disneyland, the sturdy, fireproof Settler’s Cabin was still there, but it was no longer engulfed in flames. It was engulfed in trees. 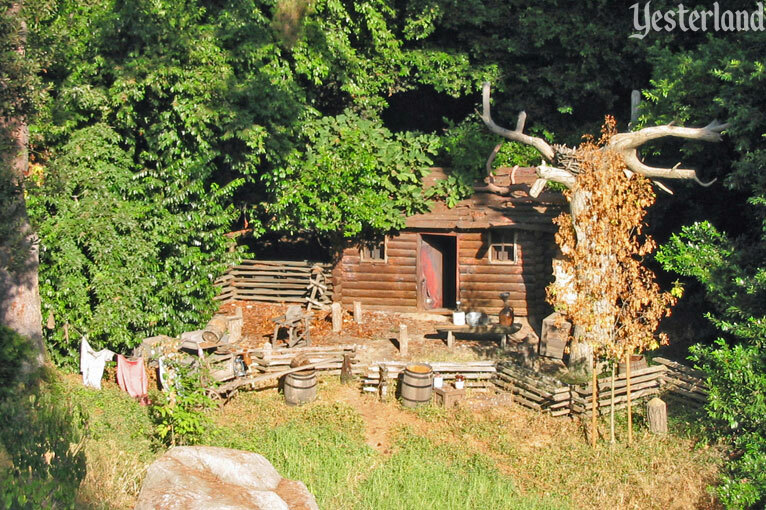 The Settler’s Cabin looked sad—a neglected remnant of the past. Instead of being the most memorable sight along the edge of the Rivers of America, it was easily overlooked. There was no official explanation for why the flames were extinguished. One story was that the gas line needed replacement, but it would be too costly. Another story was that the flames are a victim of California’s strict emissions standards. This wasn’t the first time that the flames went out. During the period when the settler was a victim of river pirates, the flames were a victim of the energy crisis. 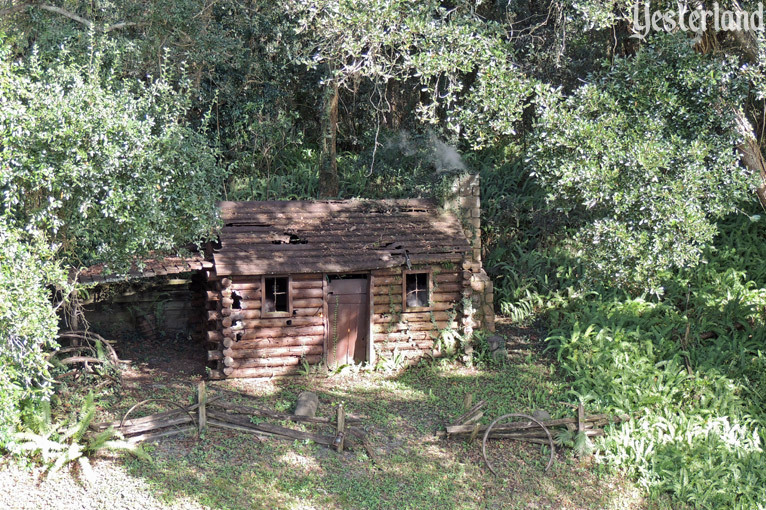 The cabin burned with the same artificial fire effect as used in Pirates of the Caribbean. It’s a great effect in the indoor Pirates ride, but was not convincing outdoors. The real fire returned in the mid-1980s. 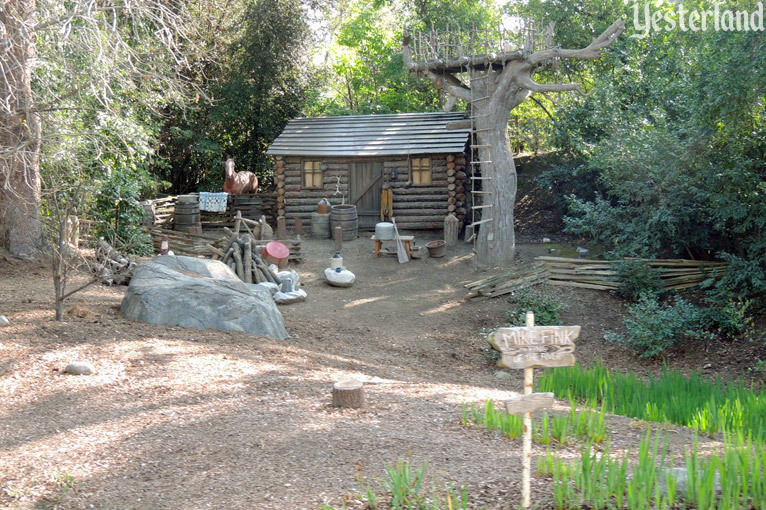 As part of the Pirate’s Lair makeover of Tom Sawyer Island in 2007, the former Burning Settler’s Cabin became a well-tended Settler’s Cabin. The settler even gained a motionless horse. There were no longer holes in the roof or empty windows for flames. The Settler’s Cabin would never burn again. So what happens when a house gets flipped? Someone moves in, of course. 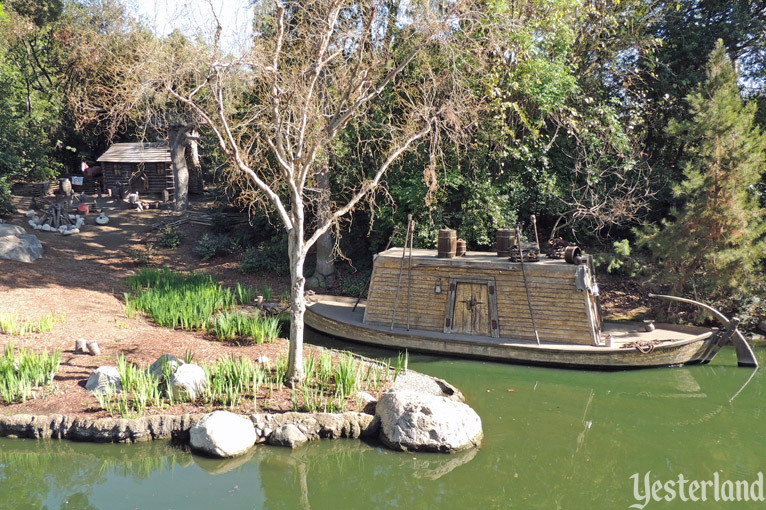 During the 2010 refurbishment of Disneyland’s Rivers of America, the fixed-up cabin became Mike Fink’s Cabin, with his keelboat, the Gullywhumper, docked in front. The refurbished cabin was a nice place, but Mike Fink had to move because of Star Wars. Rivers of America closed January 2016 for the north end of Tom Sawyer to be chopped off and the river loop shortened. Good-bye cabin. 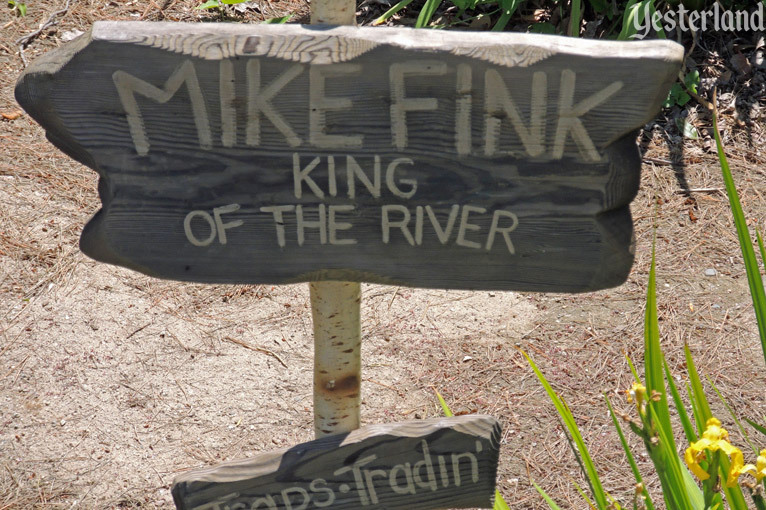 When the work was done and the Rivers of America were refilled in July 2017, Disneyland guests discovered that Mike Fink had an even better cabin. 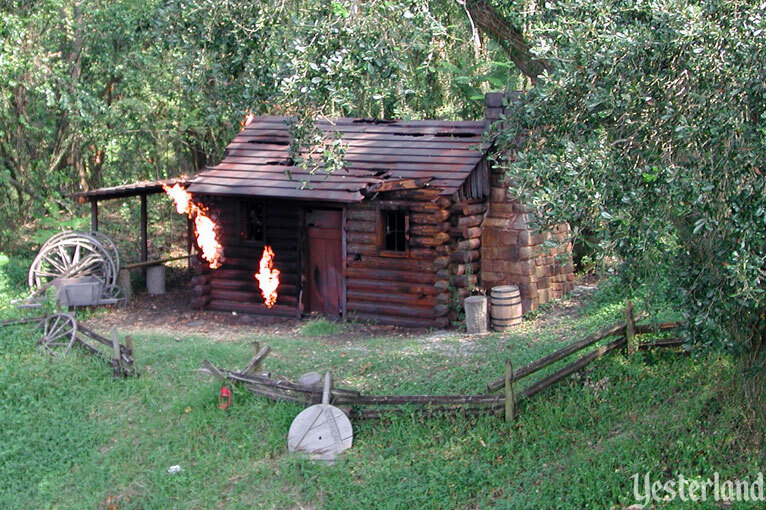 There was also a Burning Settler’s Cabin at Walt Disney World. Like its California cousin, the cabin in Florida stopped burning long ago. Unlike its California cousin, the cabin in Florida still looks sad and neglected. The Liberty Belle Riverboat went down for “rehab” in September 2005 for nearly a year. 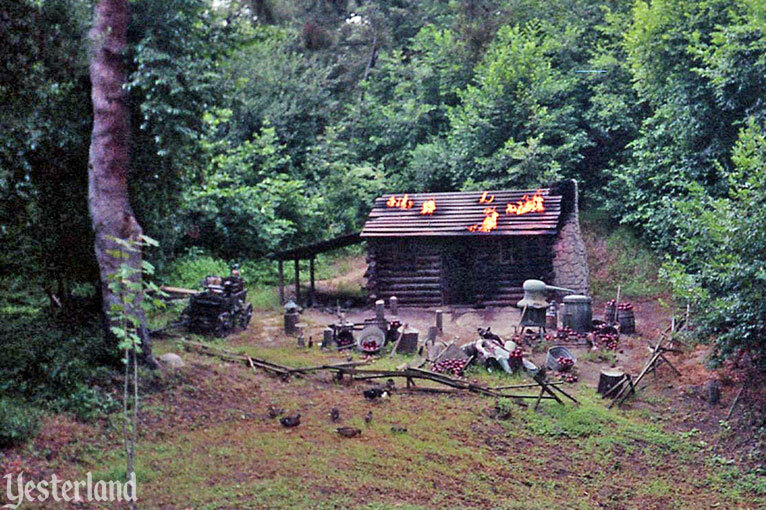 Because guests would not see the Burning Settler’s Cabin, Magic Kingdom management turned off the flames. The riverboat came back, but the flames didn’t. Although there was not an official explanation, the story at the time was that the pipes that supplied propane for the fire—the original pipes from 1971—had deteriorated due to age and a year of not being used. 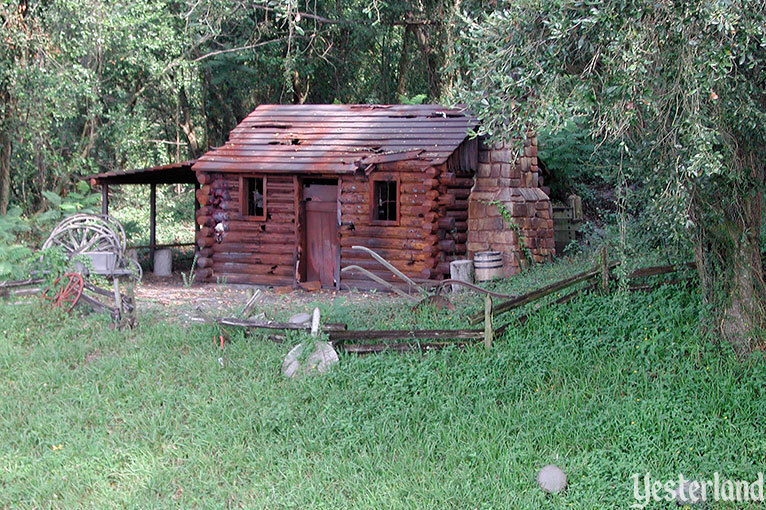 Unlike its Disneyland counterpart, the cabin at Magic Kingdom Park has never been fixed up. The openings for flames are still there. Does that mean the fire will return some day?